Gopal Navale has become a familiar face at the MG Road Boulevard, since the beginning of this month. The man behind the once wildly popular Freedom Jam, Navale pioneers the concept of busking in the city with performances every Sunday evening. A trend sparked off by musicians across the globe, it involves street performances where donations and tips are collected from the audience. 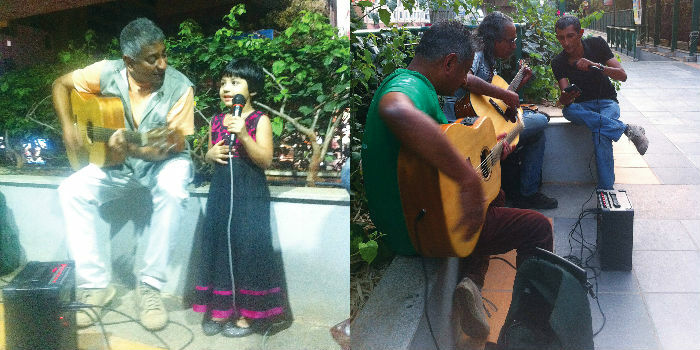 While street plays have been the norm in India for decades, Navale brings rock and folk music to the masses. a�?With busking, you get a mixed audience, as against a concert or show that is paid for. Right from a burqa-clad lady to kids of all ages, they come, listen and dance to my music,a�? Navale begins. A guitar, a mike and a battery-powered amp are the only props he needs to set up and he is always joined by musician friends who include drummers, other guitarists and even a djembe player. He soon plans to invite classical musicians to busk with him. a�?I think that would be pathbreaking,a�? he enthuses. An environmental engineer by profession, Navalea��s set list includes originals with environmental and topical themes. a�?Like this song on match-fixing thata��s really popular. And another called Hakki, which is a Kannada folk song sung in a blues style with hip-hop elements,a�? he shares, while strumming. This weekend, expect a set list that includes a few Carnatic songs with an African twist and nursery rhymes interpreted in a blues-y way, and folk numbers like Kandena and Bhoomi Thaayi Balaga that talks about preserving nature. a�?Ita��s really fun to see kids react to these songs,a�? he shares. A part of the fusion band Esparanto, Navalea��s busking projects are entirely his own, while his band make guest appearances every now and then. a�?Ia��ve just started the fire. I hope it spreads,a�? he signs off. Sundays, 5.30 pm . At MG Road Boulevard.